Reference number for this case: 2-Oct-54-Saint-Souplet. Thank you for including this reference number in any correspondence with me regarding this case. A resident of Saint-Souplet, in the Cambrésis, received a curious visit in the night of Sunday to Monday. Awaked by a brief slapping nois, the witness told: "I first of all believed in a fire in the opposite building, but it was in fact a luminous ball which went up towards the sky. A pane of door was puffed up and the glass reduced in hundreds of small pieces had been very dispersed in the contiguous room. At the place from which the machine had just left, the vegetables of the garden were all lying in the same direction; some were uprooted, just at the place where the ball had been posed. With the exception of the broken window which could be explainable by the air volume displacements of the apparatus, no other damage was made to the property." The authors indicate that in Saint Souplet in 1963 or 1964 at nightfall an anonymous woman was sleeping with the shutters open in spite of the nightfall when she was suddenly awaked by a violent noise and saw a luminous mass of red color which took off of her garden. She informed her son but as it was dark they decided to go to see in the garden only the next day. In the morning they noted that the spinach field seems crushed on a circular zone approximately 3 meters in diameter, without apparent burn, nor break but with a kind of fading of each plant. A wire which crossed the zone was neither broken nor slack. The higher pane of one of the window of the woman was broken in a rather regular manner but the projectile which could have done this and the pieces of glass were not found. They later discovered the pieces of glass projected on the other side of the room behind a piece of furniture, and what was even more abnormal was than this ordinary window glass was broken in small parts as it happns with pyrex glass. At the time of the investigation a photograph of the time was brought out which showed the hole in the pane. Another person who slept in the next house heard the violent noise at the same hour and compared it with the amplified noise of a slammed door. The authors indicate that the source is LDLN #153 page 22. The scientist indicates that there was a case of crop circle in France many years ago in St. Souplet in the Nord in which a circle formation in a large patch was coincident with a red ball of light and acoustic noise. The sources are noted "Anon. 1976, Nord Matin, October 1954". The author indicates that in the night from October 2nd to the 3rd, 1954, in St. Souplet in the Nord, an anonymous resident was awaked by a slapping sound and saw a luminous ball outside go up in the sky. A pane of his door was blown away, the glass was spread in hundreds of tiny parts in the contiguous room, and on the site of the takeoff, the vegetables of the garden were lying in the same direction, some even uprooted where the sphere had been posed. Jean Sider indicates that the source is the local newspaper Nord-Matin, of Lille, for October 6, 1954, page 10. The Belgian ufologist indicates that in 1964 or 1963 in France, in Saint-Souplet (the Nord), "At nightfall Mrs. X sleeps. The shutters are not closed. She is suddenly awaked by a violent noise and sees a luminous mass of red color which takes off of her garden. The next day with her son, she finds the spinach field crushed on a circular zone of approximately 3m of diameter. A kind of fading of each plant, without break. The higher pane of one of the windows of the house is broken in a regular manner, but the pieces of glass or the projectile remain untraceable. Later they will find behind a piece of furniture of the room pieces of glass reduced to very small size. Another person sleeping in the nearby house heard at the same hour a violent noise, that shw compared with a noise of a door violently slammed and very amplified." The source is indicated as "M. FIGUET/ J.L. RUCHON: "Ovni, Premier dossier complet..." - Alain Lefeuvre pub. 1979, p. 649". Similar to the Premanon account, but some days later, a woman and her son heard strange noises outside their house on the night of October 2nd. They witnessed a red light in the garden, hovering above their vegetable patch, in which spinnach was growing. They reported that the light soared away in the sky. 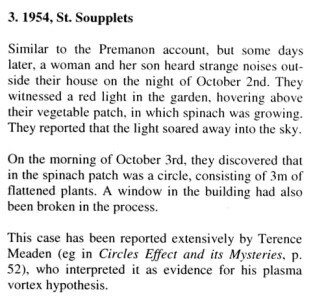 This case has been reported extensively by Terence Meaden (eg in Circle Effects and its Mysteries, p. 52), who interpreted it as evidence for his plasma vortex hypothesis. On the night of October 2, 1954, a woman and her son heard strange noises outside the house. They both had a look out of the window, to see a red light hovering above a patch of spinach. After a while the light "soared away". the next morning they found a flattened circles but otherwise undamaged. The authors say that there were 13 crop circles in France, primarily circles, with the first going back to 1954. One day in 1964, at a certain hour of the early morning two neighbor saw a circle being formed in St souplet. The circle was formed in a back garden and the two neighbors were awaked by a very loud strange noise while a brilliant light moved in the garden. The windows of the bedroom burst into small pieces of glass and were pulverized during this event. The circle which had appeared was reprted to be in spinach seedlings. Anne Moro indicates in English that in "St.Soupplets" [sic] on 03.01.1954 "In the night of October 2, 1954, a woman and her son heard strange noises outside the house. They both had a look out of the window, to see a red light hovering above a patch of spinach. After a while the light "soared away". the next morning they found a flattened circles but otherwise undamaged. Data II. Circle: 3 m diameter". SEINE ET MARNE St Soupplets A circle of 3 m in diameter. A woman and her son hear in middle of the night strange noises coming from the outside of their house. While looking by the window they observe a red object hover above a spinach piece. At the end of a while the object goes away and it is the next day that they will observe 2 circles of flattened seedlings. About ten years ago, towards the years 1963.1964, Mrs. X..., already old, slept home. The shutters were not closed in spite of nightfall. She was awaked suddenly by a violent noise, and then saw a luminous mass of red color, rise of her garden. She informed her son, and as he grew dark, they décided to go to see in the garden the next day morning. Their morning examination enabled them to note that the spinach field seemed crushed on a circular area approximately 3 m in diameter. No apparent burn, but a kind of fading of each plant, without break. In the same manner a wire, tended close to the ground, crossed the touched zone and was neither broken, nor slack. They also noted that the higher pane of one of the windows of Mrs. X... was broken in a rather regular manner, but the pieces of glass remained untraceable. They discovered them, later, projected in the other side of the room, where they had come to fall behind a piece of furniture; what seemed even more abnormal was the fact that the ordinary window glass was pulverized in small pieces (as those which our pyrex glass gives). A photograph of the time was brought out and showed the hole in the pane. Another person, sleeping in a close house, heard, at the same hour, the violent noise, that she compared with a noise of violently closed door, and very amplified. At the time, an investigation of gendarmerie was carried out. After this affair, Mrs. X... did not feel well, but she thought that it was the continuations of her fright. [nm1] Article in the regional newspaper Nord-Matin, Lille, France, page 10, October 6, 1954. [---] Ufology magazine Lumières Dans La Nuit (LDLN), France, #153, page 22, March 1976. [fr1] "OVNI: Le Premier Dossier Complet des Rencontres Rapprochées en France", book by Michel Figuet and Jean-Louis ruchon, Alain Lefeuvre publisher, page 649, 1979. [---] "Circle Effects and its Mysteries", book by Terence Meaden, Artetech publishers, U-K., page 52, 1989. [tm1] "Circles from the sky: proceedings of the first international conference on the circles effect at Oxford, together with post-conference additions", by George Terence Meaden, Souvenir Press publishers, U-K., 1991. [js1] "Le Dossier 1954 Et l'Imposture Rationaliste", book by Jean Sider, Ramuel publisher, France, page 242, 1997. [as1] "Crop circles: Signs of Contact", book by Colin Andrews, Stephen J. Spignesi, Career Press publishers, U-K., page 79, 2003. [dc1] Posted by ufologist Dominique Caudron on the francom ovni web forum, (to react against a website who said it was a crop circle case), March 2003. 1.0 Patrick Gross February 27, 2009 Conversion from HTML to XHTML Strict. First formal version. Additions [js1]. 1.2 Patrick Gross January 11, 2010 Addition [cc1], [ge1], [as1], [tm1], [go1]. 1.3 Patrick Gross October 20, 2011 Addition [ci1].